I love baseball. It is a great game. On those long summer days the game unfolds in an evolutionary manner. Baseball's beauty opens slowly and is recorded in excruciating detail. Baseball's oral history is rich and deep. The athleticism is striking. The gamesmanship ranges from hysterically funny to absolute genius. When one goes to a baseball game you have no idea what will take place. One can witness magic on the diamond. I fell in love with baseball at age 9. I still have my baseball mitt. For many years I slept with my mitt under my pillow. As a boy, I lovingly cared for my glove all summer long. It was a cherished item. In the fall I would get some twine of rope from my mother, oil and clean my mitt, put a ball inside it and tie it up. It rested comfortably in my closet, always visible. This was bitter sweet reminder of summer days. In retrospect, I was and remain a dreamer. At age 9, I dreamed of being Tom Seaver. It was because of Seaver and Ed Charles, a journey man 3rd baseman, I came to love the Mets. All boys in the late 1960s aspired to be Tom Seaver. I emulated him when I pitched. Seaver was a power pitcher. In 1967 he was rookie of the year for the Mets. He pitched 18 complete games for a team that stunk. The Mets lost 101 game. They won 61 games. Do the math, Seaver was great. A hall of fame player from day one. Baseball laughed at the Mets but swallowed crow in 1969. What does baseball have to do with disability rights? I love baseball for reasons aside from the game. My dreams of becoming a professional player ended the same year the Mets won the World Series. I knew whatever was wrong with me as a boy would destroy my physical ability to excel at sports. I would never be as good as my brothers, both gifted athletes. I could, however, still love the game. I read the box scores. I memorized the Mets player stats. I knew the ERA of every pitcher and the average of every batter because baseball has always been about stats. But one thing connected me to the game more than anything else--my father. As a sick kid he was wildly creative in keeping my mind active. He gave me something to look forward to on a daily basis. This might not sound like much but I pretty much went from a typical boy running and jumping to being stuck in a hospital bed everyday. My father would drop off the early morning papers on his way to work. My mother would arrive later in the morning after my siblings were off to school. She would bring fresh orange juice and books for me to read. I would listen to the radio after my mom left mid afternoon. Ah, the radio. It was not just any radio. 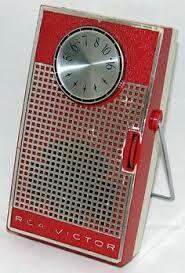 It was the first transistor radio. It fit in the palm of your hand. My father also gave me the task of listening to the live call of the horse races on news radio 88. In 1969 horse racing was big and the races were broadcast live. I wrote down who won and who lost. On his way home from work my father would bring me the late edition of the NY Post, the local tabloid. He would sit at the foot of my bed, the bed I was not permitted to leave, and we would listen to the race results. We would each write down the name of the horse, the odds, and the payoff of for win, place and show bets. After my father left, I would listen to the radio deep into the night. I listened to one thing: Mets broadcasts. This was my life for years on end. Sick for months at a time. Hospitalized for months. Home for a few months. Rinse and repeat. I am quick to admit I hit the parent lottery. My parents visited me every day when I was in the hospital. They never missed a day. The pattern of visitation never varied. They were robotic and empathetic in a stiff Irish Catholic way. They were rock solid figures. I never doubted them. I loved them without question. I felt love in return. They gave me the will to survive mind numbingly boring days. They gave me the power to endure pain that no human being should experience. I am alive because of them. More perfect parents could not be wished for. Back to baseball. I was a smart kid. I am told I was pretty darn cute too. Baseball and medicine were different in 1969. In the absence of medical technology I remember being treated with great compassion. In fact, the role of technology and compassion have been reversed. I was not allowed to have a TV or radio. Technology was frowned upon. My "job" was to get better. Limit laughter and play and focus on recovery. Wards were quiet. My parents did not accept this status quo in their support of me. They pushed hard and I was among the first permitted to have a radio. Given I was a denizen of the wards lots of people knew me. They knew I liked baseball. And I had a modern marvel--a transistor radio. It was small black and fit in the palm of my hand. In 1969 all World Series Games were played in the afternoon. If I happened to be well and at home I would ride my bike home as fast was I could and catch the end of the game. I could even call my father at work and tell him the score. If I were in the hospital, as was the norm, people would come from all the inter connected hospitals to ask me what the score was. I felt special and useful. I even kept a score card for every game played. This was so I could tell my father in detail what took place and not merely the final score. I was mesmerized by the game and the broadcast. It was a real life line. I spent a sleepless night as the thoughts above went through my mind. Baseball, my parents, and siblings were all jumbled together. My thoughts were in part prompted by the current Mets team--Matt Harvey in particular. I went to a game with my son and good friend and colleague Stephen Kuusisto. We saw the best Mets game of the season to date: Matt Harvey's first game this season at Citi Field. I vividly remember the game. It was the first time I had fun since my brother Jim died. The crowd was electric. Harvey got a standing ovation as he walked to the mound. My son looked at me in shock: he had no idea baseball could be so exciting. This game sucked me back into baseball. The Mets are good again. It has been a long time since I felt the spirit of the game. I still listen to the games on the radio but it is with half a heart. Much of my mind is elsewhere. But not this year! No sir, I have really been paying attention to the Mets. I was thrilled when they made trades at the deadline for professional and veteran hitters. I admired how they managed Matt Harvey, the Dark Knight. He is the man. He is brimming with confidence and attitude. He has a near 100 MPH fastball with lots of movement. I heard his fastball hit the catchers mitt. It is a sound you do not hear often. He is the archetype ace of a pitching staff. Harvey is also coming back from Tommy John surgery. The Mets have handled him and the "innings pitched" perfectly. They have appeased a young aggressive man with the belief we are playing for October (hopefully). He bristled over this. Baseball players are creatures of habit and thrive on routine. The Mets violated his routine. Disgust was written all over his face. They went to a six man pitching roster. He hated it. I liked this. The man has a burning desire to win. All that changed over the weekend. The details do not matter. Read any back page and the gist is the same. He might not pitch in October says his agent. Essentially his agent tossed a bomb in the Mets clubhouse. Harvey poured fire over the bomb with his lack of reply. It might be best for me, Harvey said, to limit my innings. He backtracked a bit but the horse was out of the proverbial stall. Big headlines were blazoned across the back page. Sport talk on the radio became predictably hysterical. I sighed in sorrow. The spirit of baseball sailed into the doldrums. Enter corporate baseball. My baseball fairy tail has been destroyed. The sports writers did not take note of the fact the Mets lost two of their last three games in heart breaking fashion. They wrote about innings limits, Harvey, the general manager of the Mets, and Harvey's agent who I refuse to name. They wrote about how the Mets should trade Harvey this off season. Lost in all the screaming is the game. The wonderful game of baseball. As I write these words Matt Harvey will pitch tomorrow. I cannot wax poetic about baseball now. The spirit of the game is nowhere to be found in my soul. My radio is silent and I am sad.